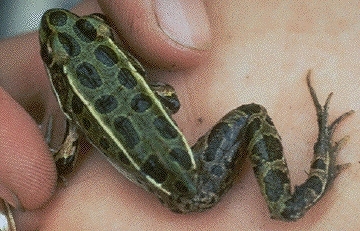 Deformed frog, only one rear leg. Photograph courtesy University of Minnesota. November 12, 2000 Corvallis, Oregon - This year the largest ozone hole on record at the Antarctic extended over the city of Punta Arenas in Chile, exposing humans, animals and plants to increased ultraviolet radiation which can cause skin cancer, kill amphibian embryos and stunt and deform those that survive. Over the next four months, atmospheric scientists will be monitoring what happens at the North Pole. Will the Arctic ozone hole also get bigger as winter takes hold and expose more humans, animals and plants to increased ultraviolet radiation? Previous PostPrevious Near-Earth Object 2000 SG344 – Is it an asteroid?